BABSEACLE is an international access to justice, legal education organization that focuses on legal capacity development and community empowerment. faculties, lawyers, members of the legal community, and justice related organizational partners in Laos since 2007 to develop Clinical Legal Education (CLE) programs at Faculty of Law and Political Science, National University of Lao(FLP CLE). Clinical Legal Education (CLE) is a progressive educational system most often implemented through university-based law programmes to help develop better-trained, more socially conscious, pro bono minded lawyers and other graduates. 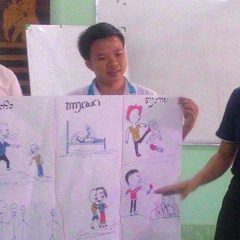 It further assists in the raising of community legal awareness and empowerment through community legal education models. When such programmes develop at scale they make a clear and significant contribution togreater access to justice and rule of law. Over the past few years BABSEACLE and/or the FLP CLE have been in discussion with other Universities in Laos on ways and means to establish CLE programme initiatives. As a result, BABSEACLE and FLP CLE are planning to help expand and support a nationwide development of CLE with other universities throughout the country. This will also help to institutionalize CLE as a core part of legal education throughout Laos. In November 2017, BABSEACLE and Faculty of Law and Political Science Clinical Legal Education(FLPCLE) help Faculty of Law and Administrative, Champasak University to establish the 2nd CLE Program(CLECPS). 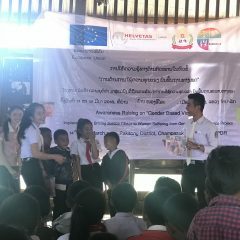 The Clinic started with the community teaching/street law focusing on awareness raising on Gender Based Violence in total of 15 Villages in Paksong District, Champasak Province. 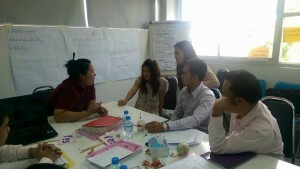 There are 3 Teachers whom help to foster CLE and with the total of 24 law students in the Program. BABSEACLE’s mission is to help establish, strengthen and support university-based and community-based Clinical Legal Education (CLE) programs. ອົງການແບັບຊີໂຄ ແມ່ນອົງການຈັດຕັ້ງສາກົນໜື່ງທີ່ເຄືອນໄຫວວຽກງານກ່ຽວກັບການເຂົ້າເຖິງຂະບວນ ການຍຸຕິທຳ, ອົງການຈັດຕັ້ງທີ່ຊ່ວຍພັດທະນາ ລະບົບການສຶກສາທາງດ້ານກົດໝາຍ ໂດຍສຸມໃສ່ການເພີ້ມ ທັກສະທາງດ້ານກົດໝາຍ ແລະ ສ້າງຄວາມເຂັ້ມແຂງໃຫ້ແກ່ຊຸມຊົນ. ອົງການແບັບຊີໂຄ ໄດ້ຮ່ວມມືກັບບັນດາ ມະຫາວິທະຍາໄລ , ວິທະຍາໄລກົດໝາຍ,ນັກສຶກສາ ກົດໝາຍ, ທະນາຍຄວາມ , ສະມາຊິກ ຂອງຊຸມຊົນທີ່ເຮັດວຽກກ່ຽວຂ້ອງທາງດ້ານກົດໝາຍ , ແລະ ບັນດາອົງການ- ຈັດຕັ້ງຕ່າງໆ ທີ່ເຄືອນໄຫວວຽກງານໃນຄົງເຂດຍຸຕິທໍາ ຢູ່ໃນ ສປປລາວ ນັບແຕ່ປີ 2007 ເພື່ອພັດທະນາ ການສຶກສາທາງດ້ານກົດໝາຍ (CLE) ຈຶ່ງໄດ້ຊ່ວຍສ້າງຕັ້ງ ໝ່ວຍງານກົດໝາຍເພື່ອປະຊາຊົນ ( FLPCLE) ຊຶ່ງຂື້ນກັບຄະນະ ນິຕິສາດ ແລະ ລັດຖະສາດ, ມະຫາວິທະຍາໄລແຫ່ງຊາດມາເຖີງປະຈຸບັນ ໄດ້ປ່ຽນ ມາເປັນ ສູນບໍລິການກົດໝາຍເພື່ອປະຊາຊົນ. ການສຶກສາກົດໝາຍໃນລັກສະນະ (CLE) ແມ່ນລະບົບ ການສຶກສາ ທີ່ກ້າວຫນ້າທີ່ສຸດ ໂດຍການນຳ ໃຊ້ເຂົ້າໃນການຮຽນການສອນ ໃນມະຫາວິທະຍາໄລ ແລະ ວິທະຍາໄລກົດໝາຍ ເພື່ອພັດທະນ່າໃຫ້ດີຂື້ນ ໂດຍຜ່ານການຝຶກອົບຮົມ, ເພີ້ມການປູກຈິດສຳນຶກໃຫ້ແກ່ນັກສຶກສາກົດໝາຍ ແລະ ລວມເຖີງຜູ່ທີ່ຈົບ ວິຊາຊີບກົດໝາຍ ໃຫ້ຄິດເຖີງຜົນປະໂຫຍດຂອງສັງຄົມຫຼາຍຂີື້ນ ແລະ ມີຈິດໃຈອາສາຊ່ວຍເຫຼືອສັງຄົມ ຜູ່ທີ່ບໍ່ມີຄວາມສາມາດເຂົ້າເຖີງຂະບວນການຍຸຕິທຳ (Pro bono). ນອກນັ້ນມັນຍັງຊ່ວຍໃຫ້ຄວາມຮູ້ ແກ່ຊຸມຊົນ, ສ້າງຄວາມເຂັ້ມແຂງ ແລະ ມີສະຕິ ເຄົາລົບກົດໝາຍ. ເມື່ອໂຄງການດັ່ງກ່າວນີ້ໄດ້ມີ ການ- ດຳເນີນ ແລະ ພັດທະນາຂື້ນ ຈະເຫັນເຖິງສັກກະຍະພາບຂອງການນຳໃຊ້ ການສຶກສາກົດໝາຍໃນລັກສະນະ (CLE)ໃນການພັນຂະຫຍາຍແນວທາງນະໂຍບາຍ ໃຫ້ກວ້າຂື້ນເປັນລັດແຫ່ງກົດໝາຍ. ໃນໄລຍະທີ່ຜ່ານມາ ອົງການແບັບຊີໂຄ ແລະ / ຫຼື FLPCLE ໄດ້ມີການປຶກສາຫາລື ກ່ຽວກັບການສ້າງຕັ້ງ CLE ຮ່ວມກັບບັນດາ ມະຫາວິທະຍາໄລ/ວິທະຍາໄລກົດໝາຍ ໃນຂອບເຂດທົ່ວປະເທດໃນການສ້າງຕັ້ງ CLE. ເຊຶ່ງ FLPCLE ຈະເປັນພາກສ່ວນຫຼັກໃນການຊ່ວຍ ສະຫນັບສະໜູນ ແລະ ຂະຫຍາຍການພັດທະນາ CLE ຢູ່ໃນ ສ.ປ.ປ. ລາວ. ມາຮອດເດືອນພະຈິກ 2017, ອົງການແບັບຊິໂຄ ປະຈຳ ສປປ ລາວ ແລະ ສູນບໍລິການກົດໝາຍເພື່ອປະຊາຊົນ ຄະນະນິຕິສາດ ແລະ ລັດຖະສາດ ໄດ້ຊ່ວຍ ສ້າງນັກສຶກສາອາສາສະໝັກກົດໝາຍ(CLE)ຄະນະນິຕິສາດ ແລະ ລັດຖະສາດ ມະຫາວິທະຍາໄລຈຳປາສັກ. ຄຼີນິກກົດໝາຍໄດ້ລິເລີ້ມຈັດຕັ້ງກິດຈະກຳການລົງໃຫ້ຄວາມຮູ້ທາງດ້ານກົດໝາຍ ເພື່ອປູກຈິດສຳນຶກກ່ຽວກັບການຕ້ານການໃຊ້ຄວາມຮຸນແຮງບົນພື້ນຖານທາງເພດ ໃນຂອບເຂດ 15 ຫມູ່ບ້ານ, ເມືອງປາກຊ່ອງ, ແຂວງ ຈຳປາສັກ. ຄຼີນິກກົດໝາຍ ດັ່ງກ່າວມີອາຈານປະສານງານທັງໝົດຈຳນວນ 3 ທ່ານ ແລະ ນັກສຶກສາຈຳນວນ 24 ຄົນ. ເປົ້າໝາຍຂອງ ອົງການແບັບຊີໂຄແມ່ນຊ່ວຍສ້າງຕັ້ງ, ເສີມຂະຫຍາຍ ແລະ ສະໜັບສະໜູນ ບັນດາ ມະຫາວິທະຍາໄລ/ວິທະຍາໄລ ອີງຕາມຄວາມຮຽກຮ້ອງຕ້ອງການ ໃນການສ້າງຕັ້ງ ໂຄງການ CLE.